Can you put a number to the amount of chances life gives you? Nine? Maybe ten? But only one of those chances will change your life for the better. I recently found that chance even before I realized it. My chance began when I met Lesser Lesser Landy & Smith’s Managing Partner Gary Lesser at the Palm Beach County Business Development Board’s “Claim Your Future” Showcase, an event for high school students that showcases career opportunities in Palm Beach county and prepares students for entering the work force. The event was comprised of businesses leaders from several companies talking with small groups of students about what it was like working in their particular field. When I look back, at the time, I was reluctant to go to the event. If not for the encouragement of my Macroeconomics teacher Mrs. Andrea Caceres, who told me it would be a great experience that might teach me something new. As the event drew closer, I got more excited and motivated. The bus ride that morning was loud and filled with anxious teens ready to start networking and gain contacts for the future. I, on the other hand, was searching for my career path. I didn’t know what I wanted to be and with college, right around the corner, the realization of planning my future got harder to determine. I stumbled through the front doors gazing at the spacious area and I took a deep breath, gathered my friends and went looking for a future career I would enjoy. As I made my way around the center, I notice the different fields of study that were being presented. Many of the fields were tech, science, or corporate based, but not Mr. Lesser’s table. His table was simply decorated and was being attended to by their Director of Communications, Angel Adams. I always toyed with the idea of being a lawyer. My family would tell me “you argue too much, you would make a great lawyer.” I knew that’s not what a lawyer does, but the idea intrigued me so much that I was drawn to the table. After a brief conversation with Ms. Adams, she encouraged me to attended Mr. Lesser’s next break-out session, as he would be better equipped to answer my questions about being a lawyer. I decided to take Ms. Adams’ advice and sit in on the discussion about working in the field of law/insurance. When I saw Mr. Lesser, I was intimidated by his professional stature and position as Managing Partner. My nerves made me hesitant to speak to him but at the end of the talk, I approached him and introduced myself. He was very kind and listened to what I had to say. I felt he was not very impressed until he said, “here is my card, keep in contact with me.” I did it! I put my foot in the door to learn about becoming an attorney. I felt so accomplished after my talk with Gary that a week later, I decided to send him an email with my contact information and interest of working with his firm as a summer intern. I would later get a call from the firm’s administrator, Laura Becker, offering me an opportunity to work as a summer intern for the firm. I was beyond elated about this news. I was finally going to experience working at a law firm and gain hands-on knowledge to help shape my future. This was all because I took a chance. Mr. Lesser saw something in me that I could not, he recognized my potential in being a great addition to the firm. Before I met Mr. Lesser, I had no idea where I wanted to attend college or what major I wanted to pursue. Mr. 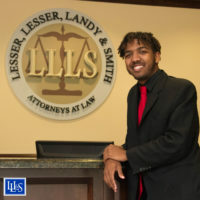 Lesser helped me to find the college that will help me on my path to law school leading me to accept the offer to attend the University of Central Florida. I will have now just started college with a major in legal studies on an accelerated path to law school. I have learned so much from my time here. I feel confident now of the path I want to take and I see myself going for a career in law. Thank you, Mr. Lesser for seeing my potential and thank you to the people who convinced me to sign up for the trip. Without their guidance, I might have missed my chance.